Allen & Heath are a company renowned for their rather large mixing desks. To go to an exhibition and be confronted with a vast mixing machine that’s larger than my kitchen table – and then to peek over that and see the seemingly miniscule Xone:02 – puts the quality and experience of Allen & Heath into context. Now take all those years of making some very fine high end pro audio gear and squash it down into a 2 channel skratch box – this gives you some idea of what the Xone:02 is about. A quick note about the review. I’ve had this mixer “on loan” for over 2 years now, hence is only has the original Alpha fader in it. But all new Xone:02’s come with a P&G as standard. So to make up for that, I put the new Eclectic Breaks Pro X fade in there. Lucky me. Picking up the Xone:02, straight away you get a feeling for the quality of A&H. It’s not too heavy but you get a genuine feeling of quality – nothing seems cheap and lightweight. And you’d be forgiven for thinking that the Xone:02 had been painted with the Vestax 07 brush. It’s amazingly reminicent, right down to the EQ faders. I’m not the first person to mention this though it could simply be down to the aforementioned EQ faders – something you don’t see very often on a skratch mixer. In terms of layout, this has to be one of the cleanest I’ve come across. The bottom half is about as clutter free as possible with only the crossfader, line faders and transformer switches. And the switches aren’t placed too closely above the line faders either (a pet hate of mine) – in fact they’re slight offset which is a welcome change. The line faders are a standard 80mm apart – handy for those of us who don’t have big hands. There’s nothing out of the ordinary – all the core features you’d need and expect from a skratch mixer are here. As I said previously, this is an older model and only comes with an Alpha VCA fader and it’s the same fader throughout. Alpha crossfader? No really it’s OK. It’s had a fair amount of hammer over the last 2 years and it’s all good as are the line faders as well. A word of warning – if you want to change out the crossfader for a P&G (or in my case a Pro X Fade), you’ll need a set of Torx heads. Why A&H did that when the rest of the mixer is Philips I don’t know. 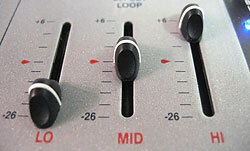 The lag time is really tight on all faders – 2mm at the most. And the curve is sweet as well – a good range at the bottom end so you can adjust to get a nice balance between super sharp for cutting and a little softer form say drumming. And it’s full curves and reverses on all faders. But the fader knobs… way too sharp for me. My fingers can actually hurt after a crabbing session. Might be worth tracking down a rounder knob, taking a file to it or it could simply be me being a fussy old bugger. While we’re on the subject of curves, the curve and reverse controls are on the front. This has been very cleverly thought out. It seems that sometimes manufacturers look at front panels from the front only. What A&H seems to have done is think about the mixer in use – when you glance down from your standing position, everything is very clear. The knobs don’t obstruct the reverses and everything is easily locatable – even in the darkest of clubs. Top marks for that. Back on top, there’s the ubiquitous transformer switches. I personally don’t use them seeing as crossfader technology is as advanced as it is. But if you do use them, these are totally click-free. I have 11 mixers in the lab and the Xone:02 is the only one that can boast this. As you’d expect, there a microphone channel. You actually get 2 microphone inputs but sadly it’s XLR so you’ll need to get converters to plug in your regular phono mics. Unusually, the mic channel has a 3 band EQ in contrast to the industry standard 2 band. And you also get the mic channel to route through the effects loop as well. This level of flexibility on a mic channel is unheard of in the skratch world. I can’t comment about linking aux sources (iPods etc) to the mic ports as you can do on some other mixers. Looking at EQ next – the Xone:02 is unusual in that it has fader EQ instead of knobs. This is a subject that seems to be pretty split right down the middle as far as the end user goes but manufacturers always seem to err on the side of caution and indeed the majority (dance DJs) and go for knobs. I’m a big fan of EQ faders and love to use these on the Xone, especially with the reasuring centre click. I just find it easier to grab then all at once if I fancy a mad EQ moment. 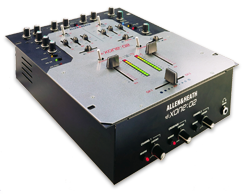 The EQ itself, as you’d expect from a pro mixer company like Allen & Heath is superb – but doesn’t quite kill. Like I said in the Pioneer 707 review, I feel people get a little too hung up on EQs killing. As long as I can strip out the bass for skratching I’m happy. Because of the faders instead of knobs there’s no matching gain knob. Instead the input level controls are located across the top. But here’s a twist. This is a real 4 channel mixer masquerading as a 2 channel one. Channels 1 and 2 are switchable between line and phono but there are also 2 extra line channels as well. This means that you can play a phono and line or 2 lines through each channel at the same time and control their volumes independently. Neat trick. And nuzzled neatly between the input knobs is the reverse switch. This is a full channel reverse – EQs, faders – everything. It’s literally like cuting the mixer in half and swapping sides. No real surprises with the cue section. Working pretty much as most mixers on the market, there’s a switch between the cue and master as well as a volume control. And in addition there’s a cue pan between channel 1 and 2. Becoming standard on all skratch mixers these days, the Xone:02 has had an effects loop for a long while now. Each channel is routable to an external effects unit but there’s no wet and dry control. And although though I can’t find anything anywhere to confirm this, the block diagram indicates that the effects are post-fader which means your echo effects will continue echoing even after the fader is closed. Finishing off the top of the mixer, there’s individual controls for master as well as booth output. To recap on some of what I’ve already covered – there’s 2 x XLR mic sockets. Next we have channels 1 and 2 with a line/phono switch and 2 addtional line inputs as well. Send and receive jacks plus session (or link as A&H like to call them) in/out RCA’s. It’s worth pointing out that for the bedroom DJ, the master volume control has no effect on the link out. So if you’re using link out to go to your amp, you’ll need to control the volume with booth volume only. Finally we have balanced XLR master out. I think you’ll agree that A&H’s pedigree shows in the outputs. 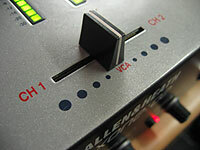 In a nutshell, the Xone:02 is a great mixer, even with the VCA crossfader. Having put the Eclectic Breaks Pro X fade in there, it’s become my favourite mixer. In all honesty, I really can’t fault the Xone:02. Being picky, I’d pull it for the lack of kills on the EQ but I just can’t find anything wrong with it – and usually find at least something in my reviews. It’s a bit of an elder statesman these days in the marketplace but that doesn’t mean it’s any less valid. The quality of A&H shines through in all the details – even more so with the inclusion as standard of a P&G crossfader. And I wouldn’t expect to see s replacement any time soon. The Xone:02 has been a very steady seller but not set the world on fire. I understand that A&H are happy to keep on selling the Xone:02 for a good while longer. And why not – it’s a really good product. So why hasn’t it sold by the truck load to the skratch heads? In all honesty I haven’t a clue. Maybe it’s the makers – known for quality club installation mixers but unknown with the street level heads. 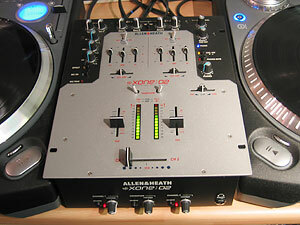 It also came out when Vestax were dominating the scene and was probably in the shadow of the 07. But the Xone:02 is a thoroughly safe bet. It’s not flashy or have any real wow features but it’s solid, dependable and fully featured – something scratch heads look for. In todays market, it costs a tad more than it’s competitors but having a P&G as standard and being made to such a high standard it’s well worth the extra cash. All in all – totally recommended. Big thanks to Debbie at Allen & Heath for the extended loan period.